One of the main reasons I came to the island of Crete this winter was to visit Knossos, the ancient Minoan Citadel near the island's capitol city of Heraklion. This was the mythical site of the famed Labyrinth of the Minotaur. Minoan culture dates from the Bronze age and is the oldest known advanced civilization in Europe. The palace at Knossos went through many incarnations over several centuries and developed in to a great citadel with spacious courtyards and a complex arrangement of rooms on several levels. The elaborate layout of the buildings may have inspired the idea of the labyrinthine concept due to a seemingly endless number of rooms and corridors at a time when the rest of Europe still resided in simple dwellings. There is however no actual known remnant of any kind of labyrinth on the island of Crete other than depictions on coins and ceramics. The Labyrinth insinuated in frescos was a kind of 'dancing ground' where rituals probably took place. So it is possible that a labyrinthine pattern may have decorated a spacious courtyard in the palace where it is hypothesized that these events took place, but there is no physical evidence of this today. The word Labyrinth is derived from the word Labrys, which was a Minoan word for a double edged ax, a royal symbol associated with creation, and a Goddess that was the protectress of the palace. 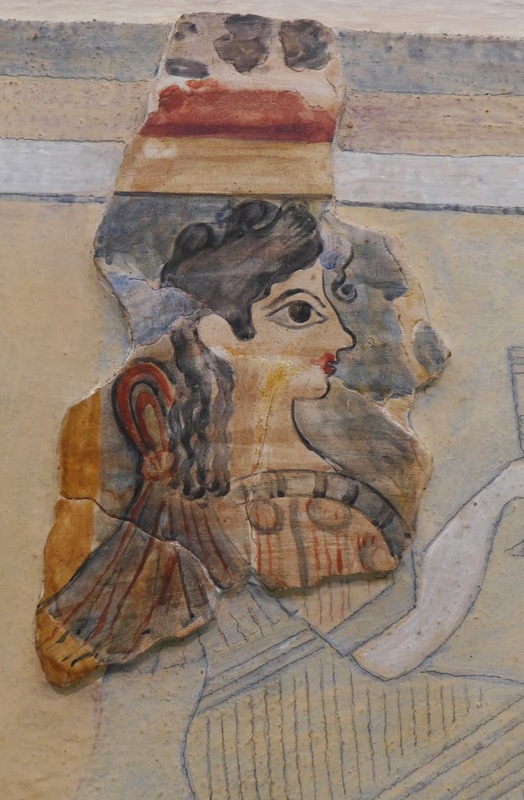 Depictions of double edged axes were found in the excavations at various Minoan palaces in different parts of Crete, but it is assumed that Knossos was the main center for the civilization, from which the great King Minos once reigned. The suffix -nth insinuates a palace, therefore, the word Labyrinth can mean the Palace of the Double Ax. Double Ax symbols have been found in excavations of other ancient cultures that would have had influence on the Minoans. I must note that the name Minoan was the invention of the colorful archaeologist Arthur Evans who led the excavations at Knossos, and that much of what we consider to be historical fact is the highly interpreted vision of this man and other modern scholars. 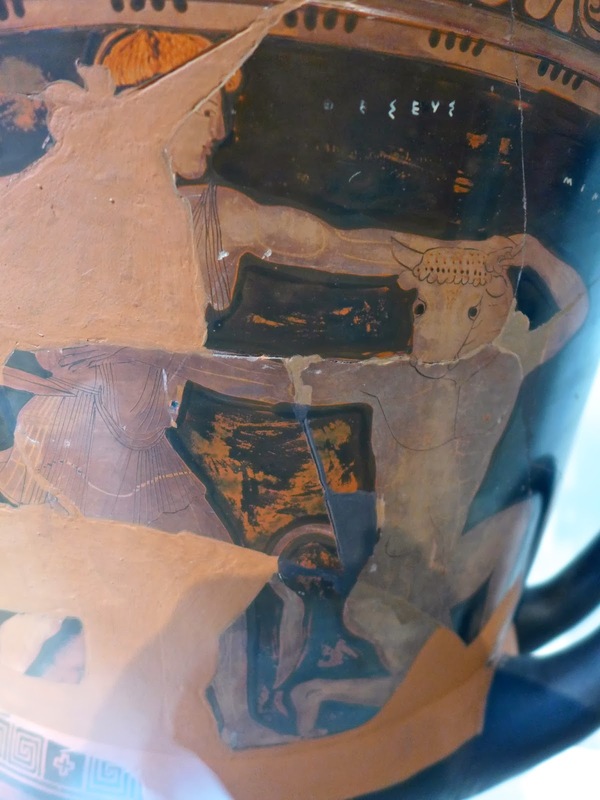 The most famous myth related to Minoan history is that of the Minotaur. The story goes as this: King Minos had promised to sacrifice his most beautiful and prized white bull to Poseidon, the God of the Sea, but spared the bull and sacrificed another in its place. Poseidon's revenge for King Minos rejection of the chosen sacrifice was to have the Goddess Aphrodite cause the King's wife Pasiphaë, the daughter of the God Helios, to fall hopelessly in love with the bull. Daedalus, the court architect designed a wooden bull for her to hide in so that she could entice the bull to make love to her. She was impregnated and gave birth to the the terrifying half man/half bull, the Minotaur. In order to hide this fearful creature, who fed on humans and wreaked havoc on the Minoans, King Minos commissioned Daedalus to design a labyrinthine palace from which the Minotaur could not escape. During a time of drought in Athens that was said to have been brought on by the murder of King Minos son in an act of jealousy due to his supremacy in the Panhellenic Games, the Athenians to the north asked the Oracle at Delphi for consul, and were told to pay homage to King Minos on Crete. 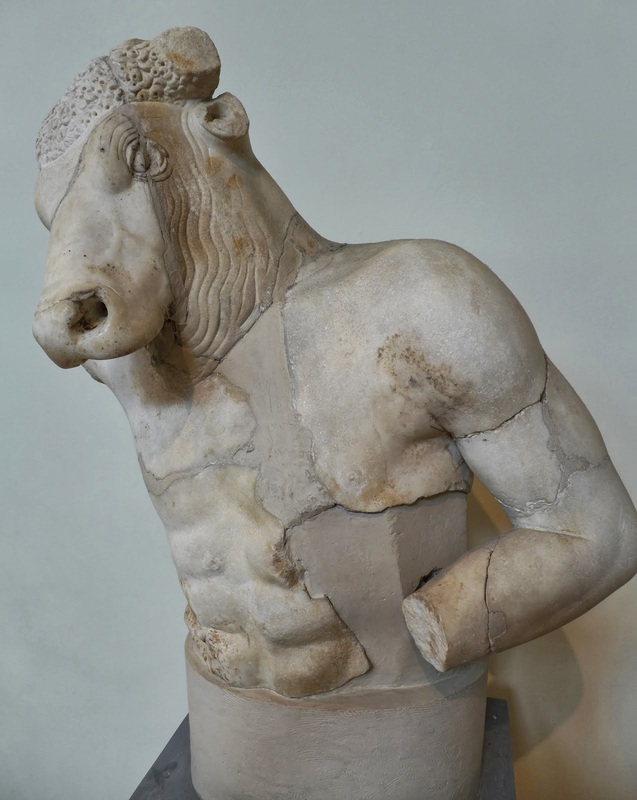 Minos, an offspring of the God Zeus then asked that every seven or nine years, the Athenians provide seven young men and seven maidens from noble families to be sent to Knossos to be sacrificed to the Minotaur. It was at one of these cycles that Theseus, an Athenian Prince was selected to make the journey to Crete with the other youths, vowing to his father, King Aegeus to slay the Minotaur. The Princess Ariadne, the beautiful daughter of Minos and Pasiphaë, and therefore a half sister to the Minotaur, held the keys as the keeper of the Labyrinth. 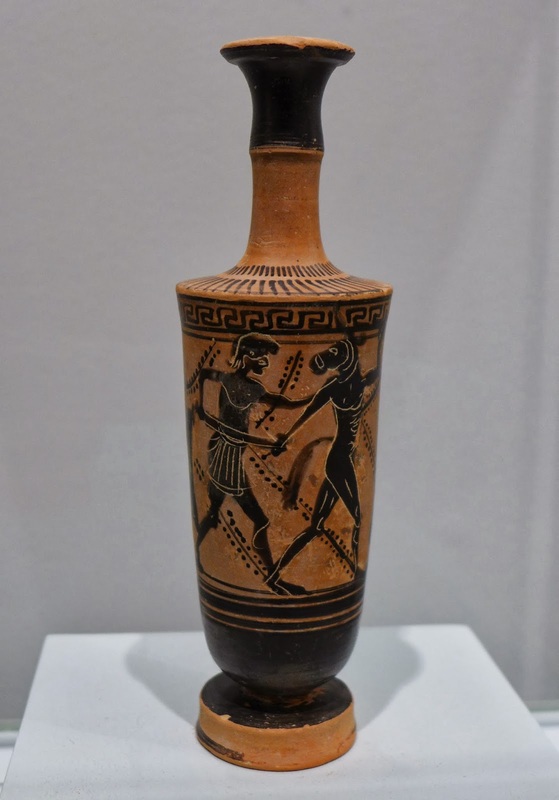 In popular fashion to our archaic desire for idyllic scenarios, she fell in love at first sight with the handsome and valiant Theseus on his arrival to Crete. From the architect Daedalus, she learned that the only way to escape the complexity of the Labyrinth was to return via the same route. Daedalus gave her a ball of silken yarn, which she then gave to Theseus so that he could uncoil it as he made his way to the Minotaur and then follow it back to the entrance. This ball of yarn was called a clew, from which the word clue was derived. So with the great sword of King Aegeus and the clew thread in hand, Theseus and his comrades were able to enter the Labyrinth, slay the Minotaur using Theseus father's sword, and find their way back out. I have read that this tale may have been conceived as a way to assert Athenian superiority over the Minoans through myth, by overcoming their most powerful entity. Theseus then escaped to the beautiful Island of Naxos with Ariadne, birthplace of the God Dionysus. When Dionysus, who was often philandering with Satyrs saw the princess sleeping, he fell in love with her, depending on the multiple versions of this story to be found. He appeared to Theseus in a dream and convinced him to return to Athens without Ariadne, and Dionysus married her shortly afterward. 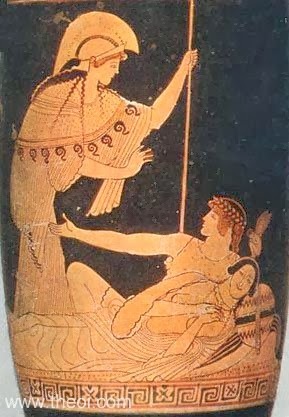 There are many depictions of Theseus being led to a ship by Athena on Attic Vases, leaving Ariadne to her divine consort. This version of the story would absolve Theseus from being a deserting cad. The fate of Ariadne after this time has elements of tragedy, as some say she never recovered from the loss of Theseus, but in the loftiest tales she was deified by Dionysus and transported to the Heavens, where her jeweled garland sparkles as the 9 stars in the constellation Corona. On returning to Athens, Theseus was supposed to raise white sails on his boat if he had been victorious and black sails if he failed, but in his distracted state at having abandoned Ariadne, he forgot to switch the sails. His father, King Aegeus, seeing the black sails from a tower, threw himself to his death in the sea, which now bears his name, the Aegean. 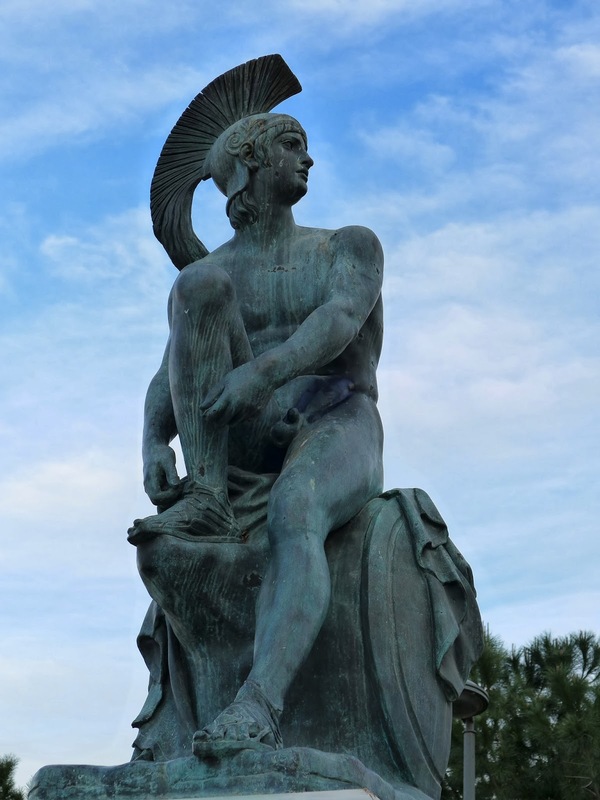 His son Theseus then ascended to the throne as the King of Athens. Historically, Labyrinths come in two types, one that is Multi-cursal, like a maze, with multiple dead ends meant to complicate escape, and Unicursal, where the entrance leads through many turns, eventually to the center in a single path. There is no known archaeological record of a Labyrinth at Knossos or at any other site on the island of Crete, but depictions are found on coins and in literary accounts. Some had multi-cursal designs but unicursal ones predominate, even though the Labyrinth that was built to contain the Minotaur was obviously intended to be inescapable. Round labyrinth petroglyphs have been found that date to the Bronze Age, around the time when Minoan society on Crete was flourishing. 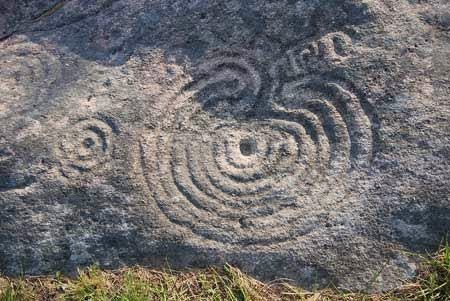 The oldest known petroglyph of a labyrinth is carved on a seaside stone at Mogor, in Galicia, Spain and is estimated to be about 4,000 years old. 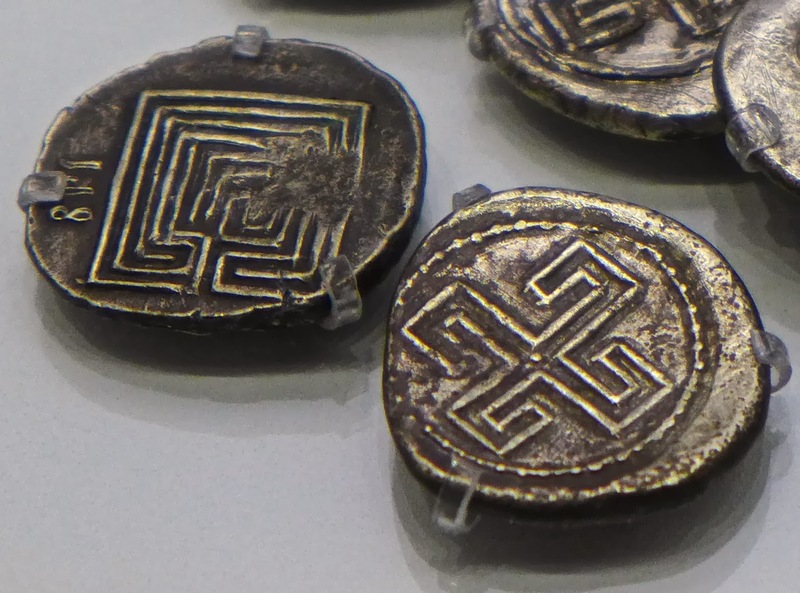 Depictions of labyrinths continued to appear on coins, and painted on ceramics, and later in elaborate mosaics and paintings on Roman floors and walls, commonly in a square architectural form. Many were large enough to walk on, leading to the idea that they may have been used as a meditative or ritualistic path. The oldest known Medieval pavement labyrinth, dating from the second decade of the 13th Century, is set in the floor of the Chartes Cathedral near Paris, France. It is an 11 circuit design that is considered to be the classic format for modern labyrinths being built in America today. 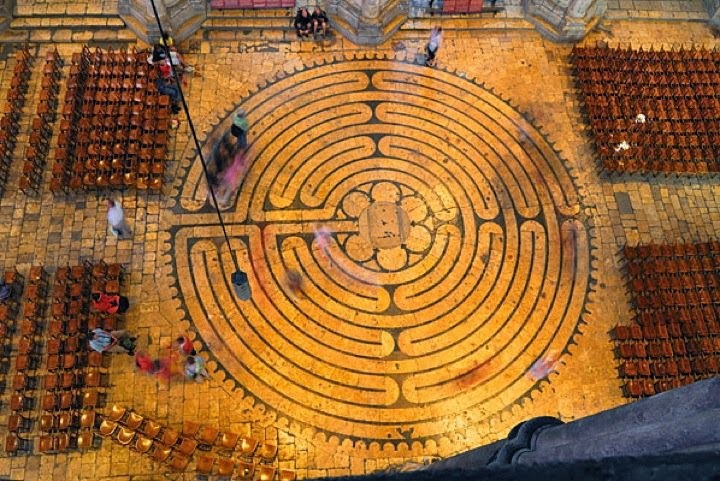 Labyrinth aficionados flock to this cathedral to walk the labyrinth when it is accessible. Unfortunately when I was in Paris at the beginning of December the Labyrinth was covered with chairs for the holiday concert season and I was unable to see it. This 11 circuit design is the one that I have used to create the Halls Hill Labyrinth that I am building on Bainbridge Island in Washington State. I traveled to Greece not only to visit the home of the fabled Labyrinth at Knossos but also to collect stones to incorporate in to the remaining circuits of the Halls Hill Labyrinth that I have yet to complete. Because the 9 inner circuits of the project are dedicated to the nine planets, which are named after Roman and Greek Gods, I have also been visiting sacred sites in Greece where the Gods were believed to have been born or resided. I returned from my trip with an interesting assortment of stones that I felt embodied the essence of the places from which they came. It is my intention that by incorporating them in to the mosaic that they will form a connection to the divine energy of these myths that offer a means of explaining our relationship to our universe. While on Crete I also visited the archaeological site Phaistos on the southern coast, where the ruins of another great Minoan palace complex are located. This site is best known for the Phaistos Disk, a round fired clay disk dating from the Middle or Late Minoan period of the 2nd Millennium BC. The disk is imprinted on both sides in a spiral stamped in a clockwise direction with a total of 241 indentations of 45 different symbols that would indicate a kind of script. The meaning of the symbols has never been deciphered as there are no other known examples to compare them to. The symbols were made by stamping small carved seals in to soft clay and then fired in a kiln, making the disk the first known work of 'typography'. The spiraling layout of the symbols bordered by a line mirrors the spiraling forms found in Nature, such as the universe itself, turning and expanding outward at the same time. The circular labyrinth that I am building is essentially a path turning round and round leading from the outside to the center and then back out again in a kind of spiral dance. I purchased a small copy of the Phaistos Disk to incorporate in to the Labyrinth mosaic to represent a connection to Minoan culture and the labyrinth myth. These include pebbles from a radioactive hot spring on the Lesvos, the island where the Muse Sappho lived. There is one from Nea Moni, a World Heritage Site Byzantine monastery on the island of Chios. I collected some from the birthplace of the Goddess Hera on the island of Samos, and the capital of the Cyclades island group, Syros. There are stones from Tinos, which is holy to Orthodox Christians, and Mykonos, and Delos, the birthplace of the God Apollo and Artemis. Luminous white Parian marble from the island of Paros will gleam in the Labyrinth. The Venus de Milo was carved from Parian Marble. I will make a lightning bolt from shards collected from the Zas Cave where the God Zeus was said to have been raised on the island of Naxos, along with pebbles from the beach of the Delian Apollo, the temple of Demeter, and the Temple to Dionysos, who was born on this island. Small red pebbles from the dramatic volcanic caldera of Santorini, and a pebble from the burial site of the great Greek writer Homer on the island of Ios will find a special place in the mosaic work. I spent 3 weeks on the great island of Crete and collected stones at the Minoan sites of Knossos, and Phaistos. There is one from the beach at Matala where Joni Mitchell inspired some of the song 'Carey' along with others from various breathtaking beaches. At the end of my trip I visited Pella in Macedonia, the birthplace of Alexander the Great and the site of the world's oldest known pebble mosaics. At Meteora, the breathtaking mountains in central Greece I collected stones while hiking amongst the incredible cliff hanging monasteries. And then from Athens there is a bit from the base of the Acropolis. I must say that I did all of this collecting with the utmost discretion, being mindful not to remove anything that would be disrespectful of the historic integrity of the sites from which they came. 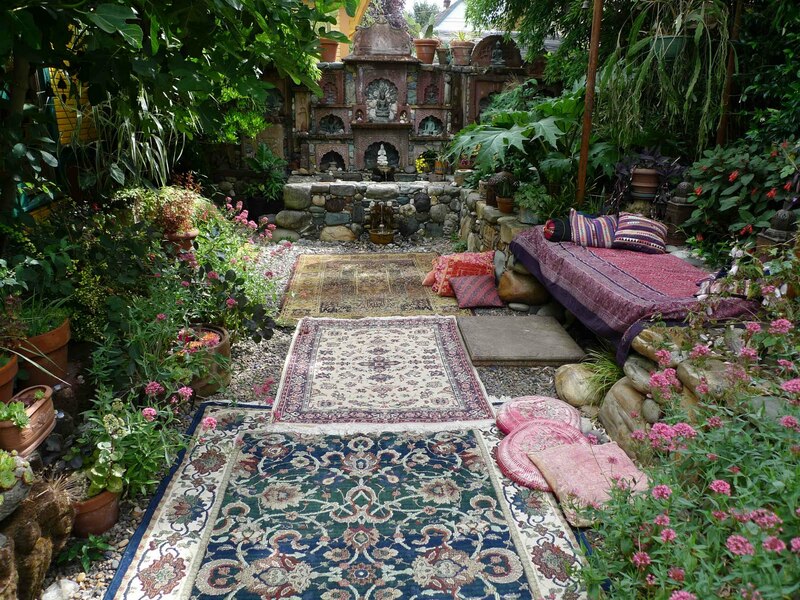 The link between these special places and the Labyrinth project gives me the opportunity to bring it in to the context of my life and the magical adventures that I have been so fortunate to experience. Its a little bit of Jason and the Argonauts, the epic story which has from an early age been a motivating influence in my desire to be a vagabond, exploring this magical planet on which we live. Life is in many ways like walking a labyrinth, and it is my intention that the one at Halls Hill Park become the very symbol of everything that is out there waiting for us to be discovered on the path of life. Bravo, Jeffrey! You could not have put the whole story better had you sung it to Apollo's lute. The "Dancing Floor" is central to the arts and the words of the last century or so. It connects the Archaic to our culture. Welcome home, Odysseus! Aw thanks Terry, I'm trying to arrange dates for accommodation up on Bainbridge. The ones I wanted weren't available, so it may be as late as the 24th before I get back to work up there. Excellent blog Jeffrey! 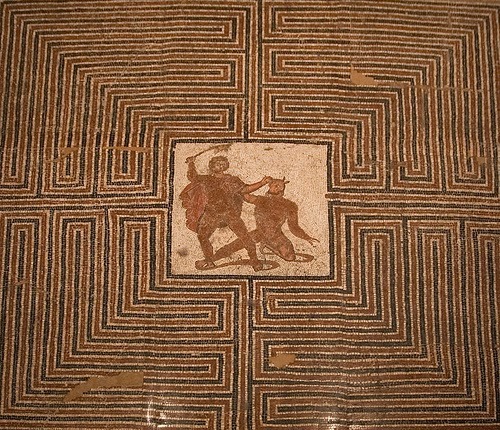 You really dug into the myth of Theseus and the Labyrinth. Would you be kind to point the exact map location of the pebble labyrinth you are building, send a google earth pin for example (.kmz file) or via any other way? It s a hobby of mine.